I noticed last Tuesday morning that we had a House wren in our yard, which is odd because where we live, we don’t have a wren’s usual habitat which is forest and bush. Instead, we have open prairie and a few spruce trees. There are woods are across the road from our house, where I know that there are many House wrens, but there has never been a House wren in our yard until now. The wren is a male, who has taken an interest in the log bird house my father built last year. The wren has been filling the house with little twigs. My mother and I enjoy watching him going in and out of the box. Now each morning I wake up to the beautiful song of the House wren. 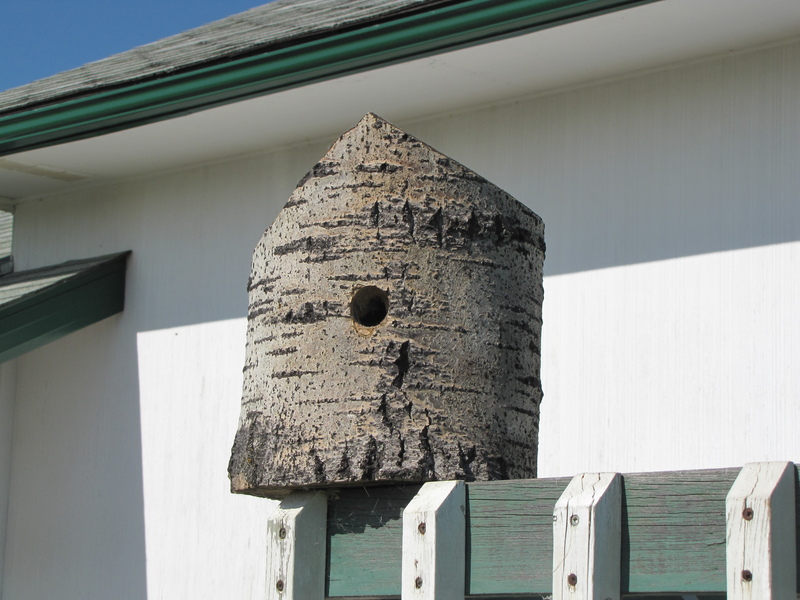 This entry was posted in Alberta Birds, Nests and eggs, Year List and tagged Bird House, House Wren. Bookmark the permalink. so cool – enjoy watching. that birdhouse is very nice! Thank you very much, dreamfalcon.